CDC Warns Of Fast-Spreading Enterovirus Afflicting Children : Shots - Health News A spike in severe respiratory infections in children has the Centers for Disease Control and Prevention asking doctors and patients to act quickly if children wheeze or have difficulty breathing. 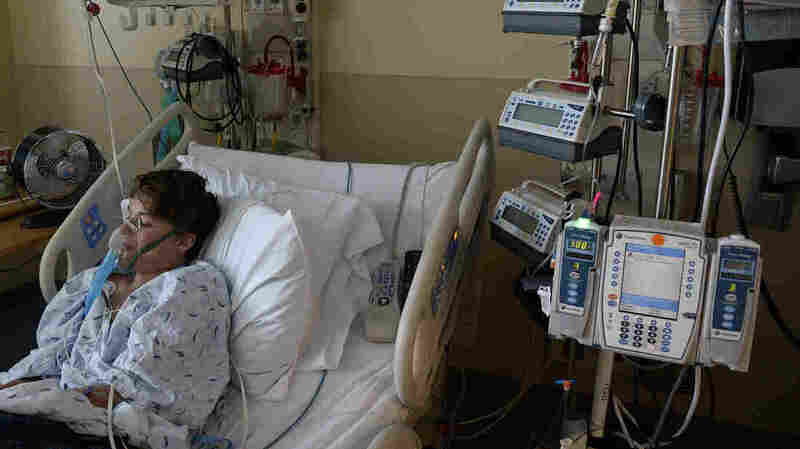 A rarely seen virus is sending children to the hospital with severe respiratory infections, and the federal Centers for Disease Control and Prevention is warning doctors and parents to be on the alert. "Hospitalizations are higher than would be expected at this time of year," Dr. Anne Schuchat, head of infectious diseases for the CDC, said Monday at a press briefing on enterovirus 68. "The situation is evolving quickly." In August, health officials in Illinois and Missouri reported a surge in emergency room visits for severe respiratory illnesses in Chicago and Kansas City. That surge is continuing. Enterovirus 68 has been identified in 19 of 22 people tested in Kansas City, and 11 of 14 cases in Chicago. The sick patients have all been children and teenagers, and 68 percent have a history of asthma or wheezing, according to a report published Monday in Morbidity and Mortality Weekly Report. No one is known to have died. So far about a dozen states have reported higher-than-usual numbers of severe respiratory infections, and the CDC is working with them to figure out if EV-68 is to blame, Schuchat says. "This is a very dynamic situation, an unusual virus, and we're just beginning to understand it." Some patients have become sick enough to end up in the intensive care unit on oxygen. Many have wheezing, even those who don't have asthma. Enteroviruses are very common, with 10 to 15 million infections in the United States a year. They usually cause mild illness, if they make people sick at all. But EV-68 is a rarer critter. It was first identified in California in 1962, but then was almost never seen until 2009 to 2012, when there were outbreaks in Japan, the Philippines and the Netherlands, and small clusters of cases in the United States. The strain of the virus in these current cases is not new, Schuchat says, and is the same as earlier EV-68 cases in the United States and in other countries. It's unclear why it's making people sicker and how it's spreading, but respiratory viruses spread very easily. Cold season typically peaks in September when children return to school, and the enterovirus cases may be following a similar pattern. Parents shouldn't worry about runny noses and sniffles, Schuchat says, but should act quickly if a child has difficulty breathing. "This can be a scary thing to hear about for parents," Schuchat says. "If your child is having difficulty breathing, you want to get medical attention." And parents of children with asthma should make extra-sure that the children are taking medications and the asthma is well controlled, she adds. There is no vaccine or specific treatment for EV-68. In 2014, five children in California suffered a polio-like illness that left an arm or leg paralyzed. Two of those children tested positive for EV-68. There have been no reports of paralysis or other neurological issues in the current cases, Schuchat said Monday. "I can't say if we'll be seeing this in many more states or not," Schuchat concluded. "It's just too soon to say."